Parallelism in ABINIT, generalities and environments. What parts of ABINIT are parallel? There are many situations where a sequential code is not enough, often because it would take too much time to get a result. There are also cases where you just want things to go as fast as your computational resources allow it. By using more than one processor, you might also have access to more memory than with only one processor. To this end, it is possible to use ABINIT in parallel, with dozens, hundreds or even thousands processors. This tutorial offers you a little reconnaissance tour inside the complex world that emerges as soon as you want to use more than one processor. From now on, we will suppose that you are already familiar with ABINIT and that you have gone through all four basic tutorials. If this is not the case, we strongly advise you to do so, in order to truly benefit from this tutorial. We strongly recommend you to acquaint yourself with some basic concepts of parallel computing too. In particular Almdalh’s law, that rationalizes the fact that, beyond some number of processors, the inherently sequential parts will dominate parallel parts, and give a limitation to the maximal speed-up that can be achieved. Such tightly integrated multi-core processors (or so-called SMP machines, meaning Symmetric Multi-Processing) can be interlinked within networks, based on Ethernet or other types of connections (Quadrics, Myrinet, etc …). The number of cores in such composite machines can easily exceed one hundred, and go up to a fraction of a million these days. Most ABINIT capabilities can use efficiently several hundred computing cores. In some cases, even more than ten thousand computing cores can be used efficiently. Before actually starting this tutorial and the associated ones, we strongly advise you to get familiar with your own parallel environment. It might be relatively simple for a SMP machine, but more difficult for very powerful machines. You will need at least to have MPI (see next section) installed on your machine. Take some time to determine how you can launch a job in parallel with MPI (typically the qsub or sbatch command and an associated shell script), what are the resources available and the limitations as well, and do not hesitate to discuss with your system administrator if you feel that something is not clear to you. We will suppose in the following that you know how to run a parallel program and that you are familiar with the peculiarities of your system. Please remember that, as there is no standard way of setting up a parallel environment, we are not able to provide you with support beyond ABINIT itself. Different software solutions can be used to benefit from parallelism. Most of ABINIT parallelism is based on MPI, but significant additional speed-up (or a better distribution of data, allowing to run bigger calculations) is based on OpenMP and multi-threaded libraries. As of writing, efforts also focus on Graphical Processing Units (GPUs), with CUDA and MAGMA. The latter will not be described in the present tutorial. MPI stands for Message Passing Interface. The goal of MPI, simply stated, is to develop a widely used standard for writing message- passing programs. As such the interface attempts to establish a practical, portable, efficient, and flexible standard for message passing. The main advantages of establishing a message-passing standard are portability and ease-of-use. In a distributed memory communication environment in which the higher level routines and/or abstractions are build upon lower-level message-passing routines, the benefits of standardization are particularly obvious. Furthermore, the definition of a message-passing standard provides vendors with a clearly defined base set of routines that they can implement efficiently, or in some cases provide hardware support for, thereby enhancing scalability (see http://mpi-forum.org). The OpenMP Application Program Interface (API) supports multi-platform shared-memory parallel programming in C/C++ and Fortran on all architectures, including Unix platforms and Windows NT platforms. Jointly defined by a group of major computer hardware and software vendors, OpenMP is a portable, scalable model that gives shared-memory parallel programmers a simple and flexible interface for developing parallel applications for platforms ranging from the desktop to the supercomputer (http://www.openmp.org). Scalapack is the parallel version of the popular LAPACK library (for linear algebra). It can play some role in the parallelism of several parts of ABINIT, especially the LOBPCG algorithm in ground state calculations, and the parallelism for the Bethe- Salpether equation. ScaLAPACK being itself based on MPI, we will not discuss its use in ABINIT in this tutorial. Scalapack is not thread-safe in many versions. Combining OpenMP and Scalapack can result is unpredictable behaviours. Characterizing the data-transfer efficiency between two computing cores (or the whole set of cores) is a complex task. At a quite basic level, one has to recognize that not only the quantity of data that can be transferred per unit of time is important, but also the time that is needed to initialize such a transfer (so called latency). Broadly speaking, one can categorize computers following the speed of communications. In the fast communication machines, the latency is very low and the transfer time, once initialized, is very low too. For the parallelised part of ABINIT, SMP machines and machines with fast interconnect (Quadrics, Myrinet …) will usually not be limited by their network characteristics, but by the existence of residual sequential parts. The tutorials that have been developed for ABINIT have been based on fast communication machines. If the set of computing cores that you plan to use is not entirely linked using a fast network, but includes some connections based e.g. on Ethernet, then, you might not be able to benefit from the speed-up announced in the tutorials. You have to perform some tests on your actual machine to gain knowledge of it, and perhaps consider using multithreading. Note that the tutorial on ground state with plane waves presents a complete overview of this parallelism, including up to four levels of parallelisation and, as such, is rather complex. Of course, it is also quite powerful, and allows to use several hundreds of processors. are, on the contrary, quite easy to use. An example of such parallelism will be given in the next section. Before starting, you might consider working in a different subdirectory as for the other tutorials. Why not Work_paral? Copy the files file and the input file from the $ABI_TUTORIAL directory to your work directory. They are named tbasepar_1.files and tbasepar_1.in. cp ../tbasepar_1.files . # You will need to edit this file. to have a reference CPU time. On a 2.8GHz PC, it runs in about one minute. Note that determining ahead of time the precise resources you will need for your run will save you a lot of time if you are using a batch queue system. Also, for parallel runs, note that the log files will not be written exept the main log file. On the contrary, you can create a _NOLOG file if you want to avoid all log files. The most favorable case for a parallel run is to treat the k-points concurrently, since the calculations can be done independently for each one of them. Actually, tbasepar_1.in corresponds to the investigation of a fcc crystal of lead, which requires a large number of k-points if one wants to get an accurate description of the ground state. Examine this file. Note that the cut-off is realistic, as well as the grid of k-points (giving 60 k points in the irreducible Brillouin zone). However, the number of SCF steps, nstep, has been set to 3 only. This is to keep the CPU time reasonable for this tutorial, without affecting the way parallelism on the k points will be able to increase the speed. Once done, your output files have likely been produced. Examine the timing in the output file (the last line gives the CPU overall time and Wall time), and keep note of it. Depending on your particular machine, mpirun might have to be replaced by mpiexec, and -n by some other option. Then, you have to issue the run command for your MPI implementation, and mention the number of processors you want to use, as well as the abinit command and the file containing the CPU addresses. Now, examine the corresponding output file. If you have kept the output from the sequential job, you can make a diff between the two files. You will notice that the numerical results are quite identical. You will also see that 60 k-points have been kept in the memory in the sequential case, while 30 k-points have been kept in the memory (per processor !) in the parallel case. Delivered    1 WARNINGs and   1 COMMENTs to log file. This corresponds effectively to a speed-up of the job by a factor of two. Let’s examine it. The line beginning with Proc. 0 corresponds to the CPU and Wall clock timing seen by the processor number 0 (processor indexing always starts at 0: here the other is number 1): 28.3 sec of CPU time, and the same amount of Wall clock time. The line that starts with +Overall time corresponds to the sum of CPU times and Wall clock timing for all processors. The summation is quite meaningful for the CPU time, but not so for the wall clock time: the job was finished after 28.3 sec, and not 56.6 sec. 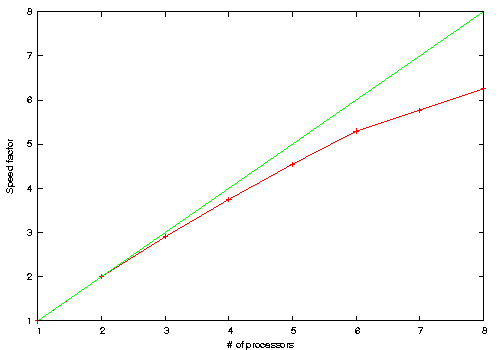 The red curve materializes the speed-up achieved, while the green one is the y = x line. The shape of the red curve will vary depending on your hardware configuration. The definition of the speed-up is the time taken in a sequential calculation divided by the time for your parallel calculation (hopefully > 1) . One last remark: the number of k-points need not be a multiple of the number of processors. As an example, you might try to run the above case with 16 processors: all will treat \lfloor 60/16 \rfloor k points, but 60-16\times3=12 processors will have to treat one more k point so that 12*4+16*3=60. The maximal speed-up will only be 15 (=60/4), instead of 16. Try to avoid leaving an empty processor as this can make abinit fail with certain compilers. An empty processor happens, for example, if you use more processors than the number of k point. The extra processors do no useful work, but have to run anyway, just to confirm to abinit once in a while that all processors are alive. The parallelization over the spins (up, down) is done along with the one over the k-points, so it works exactly the same way. The files tbasepar_2.in and tbasepar_2.files in $ABI_TUTORIAL treat a spin-polarized system (distorted FCC Iron) with only one k-point in the Irreducible Brillouin Zone. This is quite unphysical, and has the sole purpose to show the spin parallelism with as few as two processors: the k-point parallelism has precedence over the spin parallelism, so that with 2 processors, one needs only one k-point to see the spin parallelism. If needed, modify the files file, to provide a local temporary disk space. Run this test case, in sequential, then in parallel. In the second case (parallelism), node 0 is taking care of the up state for k-point 1, while node 1 is taking care of the down state for k-point 1. The timing analysis is very similar to the k-point parallelism case. If you have more than 2 processors at hand, you might increase the value of ngkpt, so that more than one k-point is available, and see that the k-point and spin parallelism indeed work concurrently. Balancing efficiently the load on the processors is not always straightforward. When using k-point- and spin-parallelism, the ideal numbers of processors to use are those that divide the product of nsppol by nkpt (e.g. for nsppol * nkpt, it is quite efficient to use 2, 3, 4, 6 or 12 processors). ABINIT will nevertheless handle correctly other numbers of processors, albeit slightly less efficiently, as the final time will be determined by the processor that will have the biggest share of the work to do. Beyond a certain number of processors, the efficiency of parallelism saturates, and may even decrease. This is due to the inevitable overhead resulting from the increasing amount of communication between the processors. The loss of efficiency is highly dependent on the implementation and linked to the decreasing charge on each processor too.